Only on a cruise ship. 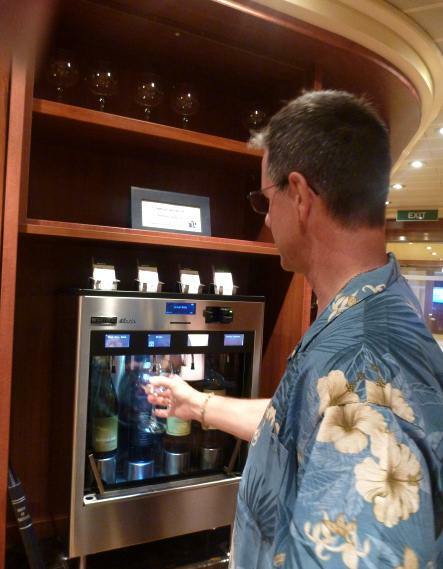 Cruise ships have many bars. Most also have a library. Normally these are two separate entities. Perhaps the bars get more use, or they wanted a way to make the library more attractive or a way to extend its hours. Whatever the reason, one of Carnival Breeze’s Funship 2.0 upgrades includes a library bar. That’s right, a library bar. 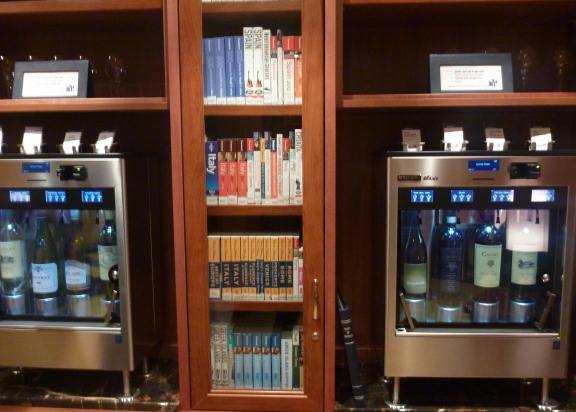 Two wine taste vending machines sit nestled on the shelves between rows of books in the library. One has red wines, the other white. The last ship we sailed on had a library full of just books. It only opened for a very short time each day. This library bar has much longer hours of operation, and whenever we’ve gone by there we’ve seen people reading or looking at the books on the shelf, but nobody buying the tastes of wine. That’s not to say they don’t, we’ve just never seen them do it. The shelf near the wine has a number of wine glasses on it. For use or for decoration? It doesn’t say. The instruction card on how to use the wine machine says nothing about needing to hold a glass under the little tube that blends so totally into the wine bottle behind it that a lot of people probably would never notice it until wine sprays from it. Discovering that does explain the glasses though – anyone deciding to sample the wine does need to use one to catch their taste of wine. I don’t drink, but I do think the Library Bar is a good idea because the presence of the wine sample machines means that the library stays open long enough for people to actually use it whether anyone buys the wine or not. It also has a bar with bartender in addition to the vending machines. This entry was posted in Breeze, Carnival, Shipboard Life and tagged Carnival Breeze, cruise, cruise ship bars, library, travel. Bookmark the permalink. Interesting idea. It’s probably the quietest bar on the ship. Probably. The bartender may get bored. The books were popular though.